Launch Your Encore, Hans Finzel & Rick Hicks. Grand Rapids: Baker Books, 2015. 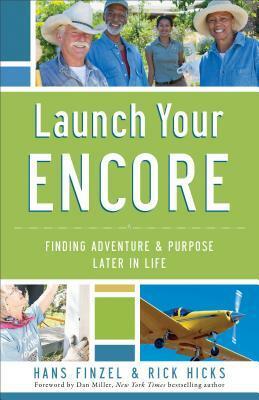 Summary: A guide to living purposefully from 60 onward, which many call “retirement” but the authors consider our “encore”. “When are you planning to retire?” It is a question I get asked more these days. The authors of this book would suggest that this is a definite tip-off that it is time for me to be planning my “encore” — how I want to live in the later years of my life, what they call the “60-80 window” or elderlescence. I agree. I’m in that window and so was curious to see how they would approach this. They begin by speaking of the challenge of the later years, particularly as we are living longer. Sometimes we just try not to think about it, which is probably the worst strategy. Transitions in work responsibilities, needing to step aside for the rising generation, and changes in our health and life circumstances including the advent of grand-children spell a change that either can be some of the best years of our lives, or a dark and bitter time. From this they turn in the second part of the book to the choices we must make. This includes a simple but clear set of biblical principles for financial health in later life. They also talk about life-mapping–considering our life journey. We can learn much from who we’ve become over the years that is of worth in discerning who we want to be in the years ahead. Part three is real-life stories that describe a variety of ways people have planned and lived out their “encores.” We see a couple who plan their encore together, another who practices “rolling retirement” and a retired college administrator who launches a charity providing shoes for children: Shoes That Fit. Listening to the voices of your past. Completing the “me at my best” exercise. They give helpful exercises for each of these elements and conclude the book with a list of other helpful references and links to resources that may help in planning one’s encore. I thought this book was a simple and straightforward guidebook to the decisions one must make to navigate the transition from what might be considered “the main act” of our lives to our “encore”. While written from a Christian perspective, there was much of benefit regardless one’s faith. At concerts, groups save some of their best stuff, their crowd favorites until the encore. The language of encore suggests that far from the show being over when we hit the 60-80 window, it might be the time for some of our best numbers. But it doesn’t happen without thought and planning and these authors provide a good handbook that seems to ask the important questions. ← Happy Birthday Bob on Books!